Marc Pecsteen de Buytswerve (2nd right), the Permanent Representative of Belgium to the UN and chair of the session, speaks at the plenary session during the ECOSOC Integration Segment. Also in the picture are Liu Zhenmin, Under-Secretary-General for Economic and Social Affairs (left), Kamoliddinzoda Ilyos Jamoliddin, Deputy Minister of Trade of Tajikistan (2nd left) and Emer Herity, Secretary of ECOSOC (right). 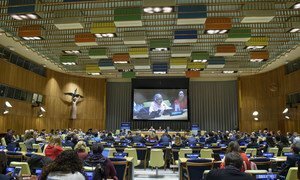 “New advances in science and technology hold immense promises for achieving the 2030 Agenda for Sustainable Development,” said UN Under-Secretary-General for Economic and Social Affairs, Liu Zhenmin, in his opening remarks to a session of the intergovernmental body overseeing the UN’s development work. 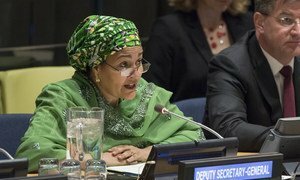 The 2018 Integration Segment of the Economic and Social Council (ECOSOC), being held from Tuesday to Thursday at UN Headquarters, brings together key stakeholders to review policies that support an integrated approach to achieving sustainable development and poverty eradication - with a focus this year on increasing resilience. He stated that a rapidly warming planet was one of the greatest threats today, but a wide array of technological measures for climate change adaptation and mitigation can help the transition from carbon-intensive growth, towards more sustainable and resilient development. Technologies can also help provide jobs to disadvantaged groups in society, and can help make cities smarter and more sustainable, by facilitating new transport systems and improving the management of natural resources. Threatened by unsustainable consumption and production patterns, the ocean is also suffering, he added. Numerous technologies have been shown to help mitigate and address these effects, such as innovations in sustainable fishing; enhanced surveillance of ocean acidification, and environmentally-sensitive forms of pollution prevention and clean-up, he added. To make new technology and innovation work in support of communities, any efforts must be driven on a local level, and be inclusive. Taking integrated approaches and working to break down barriers is of utmost urgency, too, as crises and shocks are increasingly complex and span the economic, social and environmental spheres. “And, finally, we need to build capacities and institutions for anticipating risk, and for planning and strategic foresight to effectively leverage technologies,” Mr. Liu said.